On a modified diesel engine at the Institute for Powertrains and Automotive Technology at the Vienna University of Technology, fuel-specific combustion processes are being developed and analysed regarding their feasibility, efficiency and emissions. This article handles the operation of a diesel engine with bio-alcohols. The investigated fuels are methanol, ethanol and butanol. Due to the very low cetane number of these alcohols, their usage is normally assumed with spark ignition engines but not with a compression ignition engine. However, there are technical possibilities for alcohol fuel utilization in a diesel engine: 1) small amounts of the alcohol may be added to the conventional diesel fuel and 2) the diesel engine may be modified to operate in a dual fuel mode, whereas the alcoholic fuel is fed into the intake manifold and the diesel is directly injected into the combustion chamber. The addition of 10 or 20 vol% alcohol to the diesel fuel results in a significant reduction in soot emissions, especially at low loads. No significant differences to diesel reference operation are determined when operating with alcohol-diesel blends. By supplying alcohols into the intake manifold, depending on the operating point, substitution potentials of up to 85 % energy share can be achieved before unwanted combustion phenomena prevent a further increase of the alcohol amount. At higher loads within this operation mode the efficiency is increased by almost 2 % points. The observed strong decrease in particle mass and count allows a further reduction of the nitrogen oxide emissions. 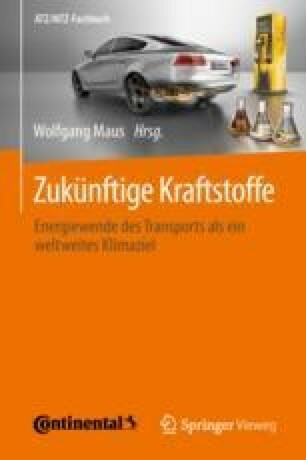 Compiled from research projects at the Institute for Powertrains and Automotive Technology at the Vienna University of Technology [1, 2].